Today I'm thrilled to have Jill from Enchanted Homeschooling Mom guest posting about her Valentine Reader. Her site is full of fabulous resources for the homeschooling (or not-so homeschooling) mom! 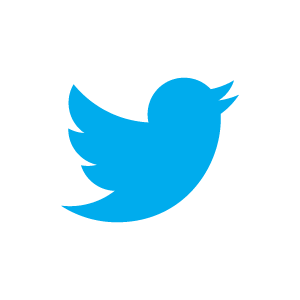 Enjoy today's post and I encourage you to head over to her blog for more inspiring ideas. For those of you who may not know me, I am Jill and I share the ins and outs of my family’s homeschooling journey on my blog at Enchanted Homeschooling Mom. I am the happy mom and teacher to Beck and Elizabeth, my two wonderful children, wife to my husband, and friend/mom to my three dogs and all the animals around our rural home. I try to take in everything that makes our homeschooling journey magical and pass it on to my readers by sharing my thoughts, my ideas, my printables, my trials, and my errors. I am thrilled to be doing a guest post on the Iowa Farmer’s Wife since I have been a fan of her site for quite a while. 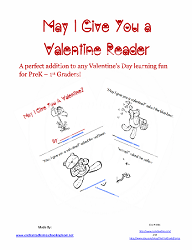 With Valentine’s Day right around the corner I created this Valentine’s Day themed reader for younger readers. The idea behind this reader is that if your student does not realize that they are learning to read the story and can interact with it by coloring the bears then they will have a magical learning experience learning to read the words. You can have them color the bears before or after you read (or they read) the story. 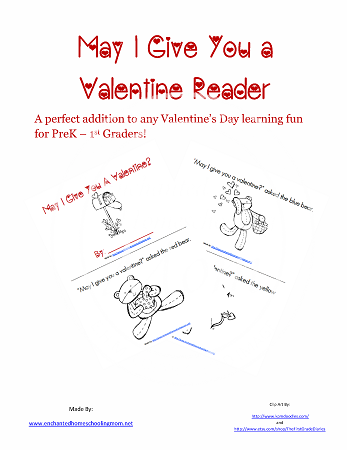 As with any reader, I have tried to make this one cute, unique, and fun so that your reader will not know that they are learning to read, but rather they will focus on reading a fun story about Valentine’s Day. I do hope that you will pop over to my blog Enchanted Homeschooling Mom and take a peek around! Click HERE to download my free May I Give You a Valentine reader. Make it a magical homeschooling day.